From their glass-blowing studio at The New Brewery Arts Centre in the Cotswolds Colin and Louise Hawkins use a combination of traditional glassblowing techniques and contemporary craftsmanship to create their handblown glass. Their work is inspired by the qualities of glass itself and the forms and rhythms of nature. Partners in life and work, Colin and Louise have been working collaboratively since 1998. 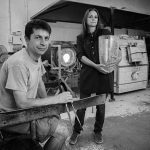 Their combined training and experience is extensive and diverse, both have been involved in glass making for over 20 years. 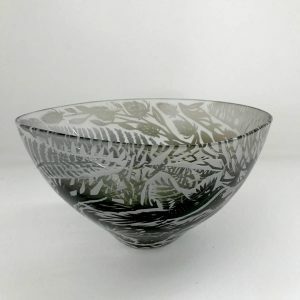 They have worked on many commissions and exhibit their One-off pieces and Studio ranges in selected galleries as well as at their studio where visitors are welcome to visit and watch the glass being made. 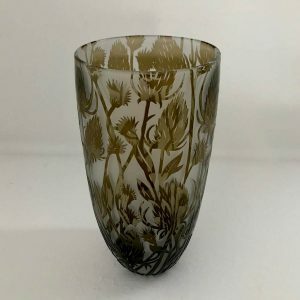 “Each unique piece of our sand carved glass is handblown and therefore no two pieces are ever the same. Inspired by nature, the artwork is hand drawn specifically to fit each piece.